Two frost bitten and emaciated horses were lucky enough to spend Christmas in a warm barn thanks to the rescue efforts of a small town in British Colombia,Canada. 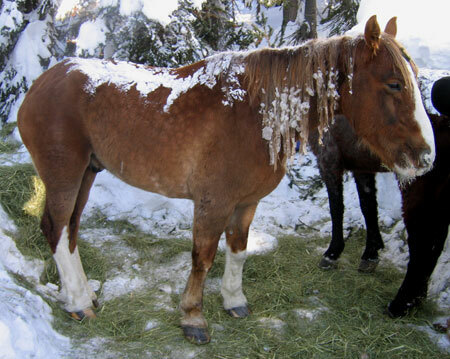 After being found by a 21 yr old snowmobiler, the horses ,who faced an almost certain death after being trapped in deep snow with temperatures plummeting to -40 C, were finally brought to safety after an intense 12 day rescue mission. It is thought the horses had been abandoned there since the Autumn by their owner. 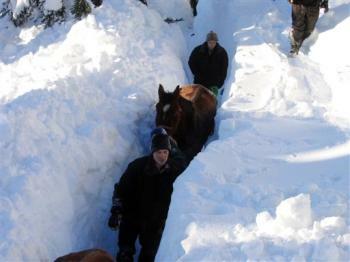 Good hearted volunteers hand-dug more than a kilometre long path in 6 foot deep snow in a desperate bid to get the horses out. They were starving with hair loss and sores from the bitter weather. Thankfully, both the horses are now safe in the care of the SPCA and are expected to make a full recovery, all thanks to the determination and compassion of this small community. The story can also be read here in the local news.